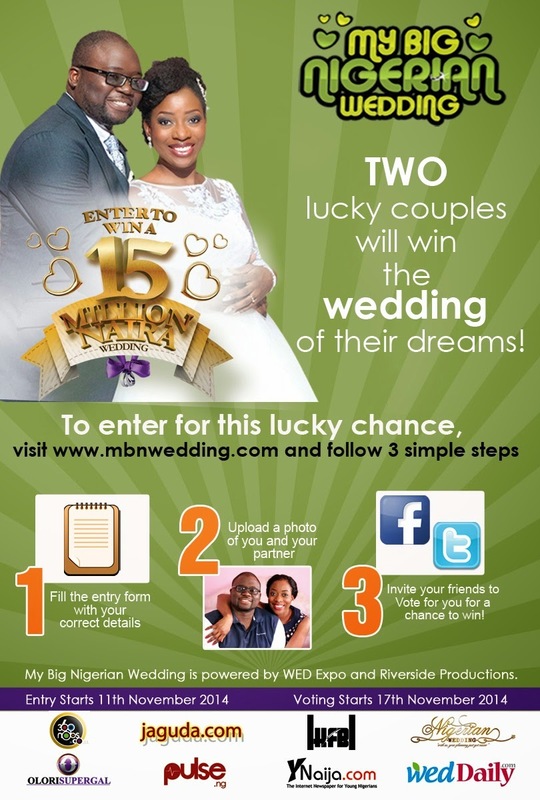 WIN A 15 MILLION NAIRA WEDDING AS MY BIG NIGERIAN WEDDING SEASON 2 ONLINE REGISTRATION OPENS! The journey to the dream weddings of two lucky couples has begun! WED Expo and Riverside Productions are proud to announce the start of entries for My Big Nigerian Wedding Season 2. This is a contest where couples can win the wedding of their dreams sponsored to the tune of N15 Million. Their wedding will be planned and co-ordinated by some of the best wedding vendors in the country. In Season 1, Yemisi & Yomi Odusanya won the wedding of their dreams and a luxury honey moon at Burj Al Arab, the world’s most luxurious hotel. This time around, two couples will win this lucky treat. There will be one wedding in Lagos and one in Abuja. Entries are now open for couples to register. The first stage of the competition is a voting process where couples can get their friends and family to vote for them to move on to the next stage. The process is easy and transparent and everyone stands a chance to win! 4. Share the link with your friends and family to get as many votes as possible. *Please note that people can vote for you ONCE PER DAY. 2. Click on this link: https://www.facebook.com/WedDaily/app_422118604517529 (MBNWedding Lagos) OR https://www.facebook.com/WedDaily/app_451684954848385 (MBNWedding Abuja) . You can also use the direct link to the couple’s profile page. 3. Search for the photo of the couple you are voting for and click on vote. You can vote only ONCE PER DAY. This is a free-to-enter competition and couples are not required to pay any money for a chance to win. Weddings would hold ONLY in Lagos (for the winning couple in Lagos) and Abuja (for the winning couple in Abuja). The My Big Nigerian Wedding Competition is a Reality TV Show that will be aired on TV Stations across the country. Couples will be shortlisted from the voting process and the finalists would be invited for a live game show in March 2015 at WED Expo Lagos & Abuja where the winners will be selected. Episodes of Season 1 have already begun airing on Iroko.tv and will soon start showing on TV Stations across the country. This is one opportunity you don’t want to miss!!! my favorite sisi, hw r u doing?